I love omelets. They are so simple to make and very nutritious. 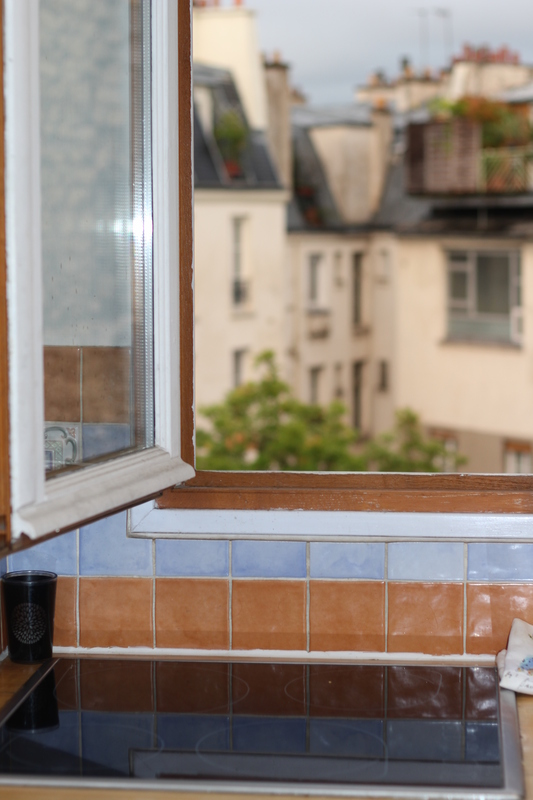 Since I have been in Paris, I find myself wanting to make them more frequently as an easy option for my evening meal. The french do this all the time. I even had Genevieve attest to it. She said french women will often have a mushroom omelet with a little cheese and baguette for a light, elegant meal. Either that or soup. So, I purchased some beautiful mushrooms at the outdoor market, as well as thyme, eggs, and a brilliant cheese I discovered here. It’s called Comte. I am obsessed. It is nutty and smooth and creamy …with a little funk. Its strong enough to put in an omelet and pairs lovely with the mushrooms and a glass of red wine. I am sure you can find it where you are if you do some research. In the states, they would probably carry it at Whole Foods. This meal took me 15 minutes and it was just as good as many of the restaurant meals I have had thus far in Paris….so that means it was DELICIOUS! First, sauté your mushrooms in a little butter and olive oil. Once they are browned, season with salt and pepper and add thyme. 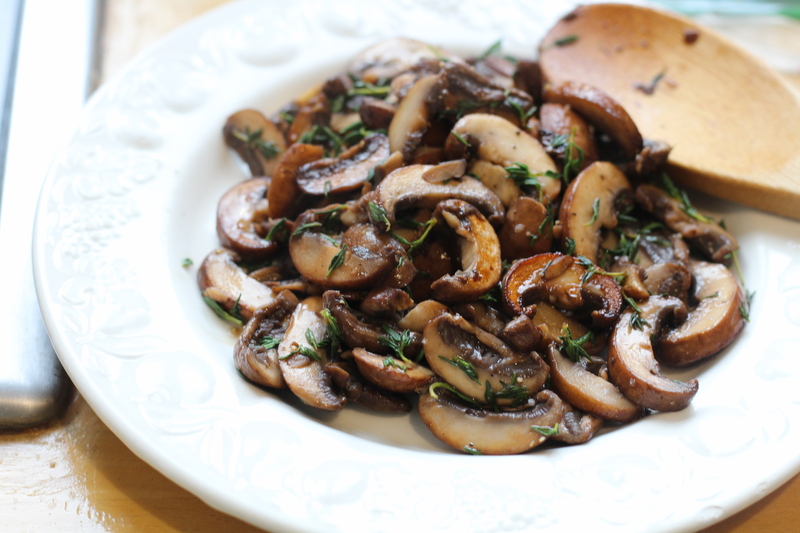 Drizzle with lemon juice or balsamic vinegar… you need a little acid to balance the salt, fat and woodsy notes from the mushrooms. 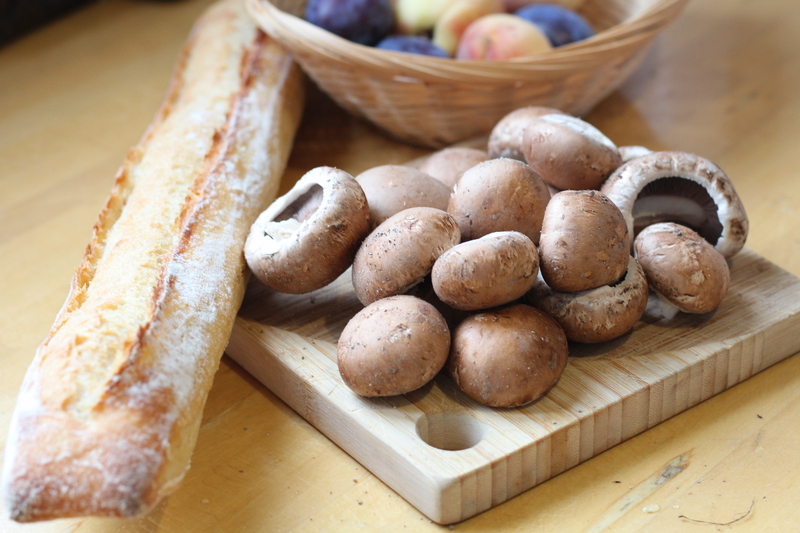 *To clean mushrooms, remove the stem and wipe caps with a damp cloth or paper towel. DO NOT put them under running water or soak them. This produces a rubbery texture once cooked. 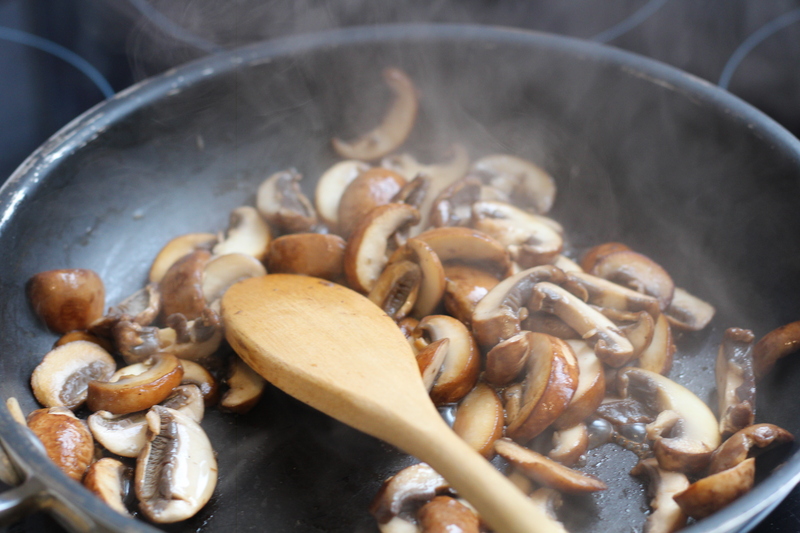 Once mushrooms are nice and browned, remove them to a plate and set aside while you cook your omelet. Crack 2 eggs in a bowl. Season with salt, pepper and thyme leaves. Scramble eggs with a whisk or fork. Heat some butter/olive oil in a nonstick pan. Once warm…I heat over high heat and then lower the temperature right as I pour in the eggs. Pour the eggs in…. and let them set (and lower the temperature). 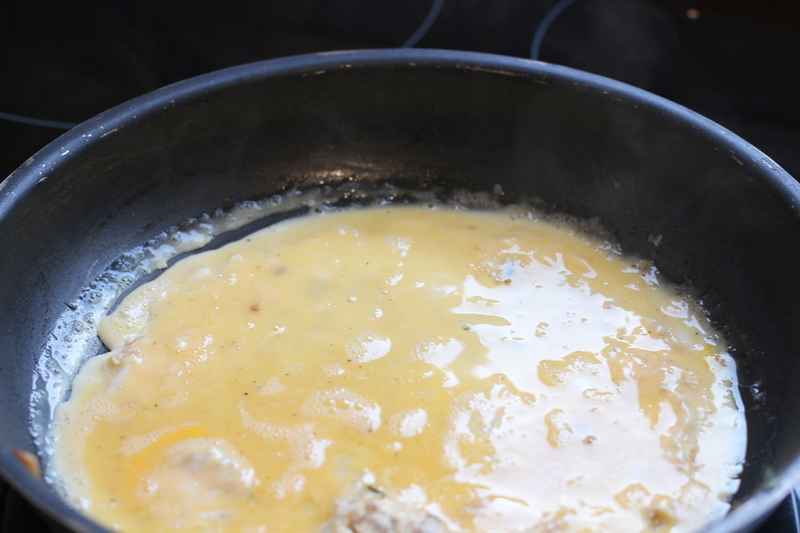 Then, you want to start making slits in the eggs and tilt the pan to allow the uncooked eggs to cover the slits so eventually all liquid has contact with the pan. Also, run a wooden spoon around the edges and tilt the pan so the remaining egg liquid reaches the sides of pan to cook. The point is not to flip the omelet. 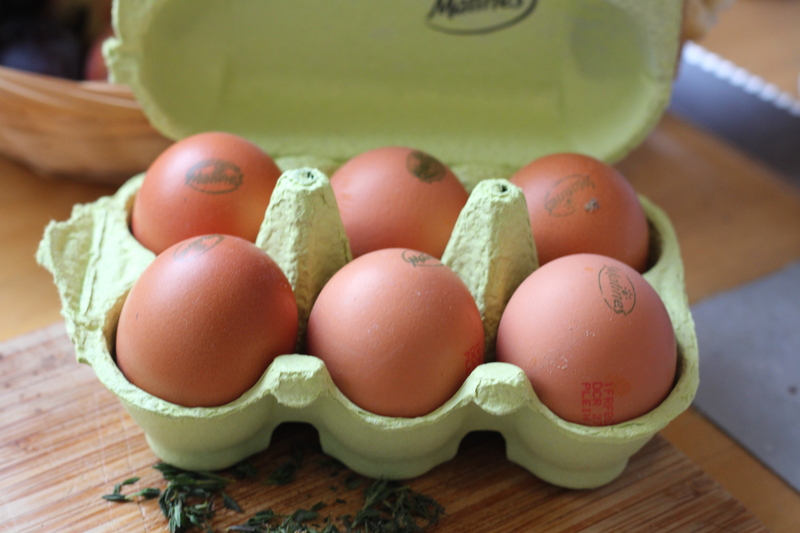 Once there is no more liquid, you will have a pillowy soft disk of eggs…. this is when you stuff the omelet. I added, as mentioned above, Comte cheese and mushrooms. Then, roll it onto your plate and top with more mushrooms. Voila! I poured myself a glass of red wine, tore off a hunk of baguette and dinner was served. So lovely. Omelets are made to order. So, if this is for more than one person…do this start to finish for each person. Okay, next. Let’s talk WINE. I am getting so excited for my stint at the Bordeaux Vineyard. It is going to be such an adventure…. I have gathered that literally, it is on acres of land, and completely out in the french countryside. I get to be a farm girl for two weeks and I am elated. I hope the family I am staying with is nice 😉 I have no doubt they will be. My first TEST in class. We were poured this wine blinde (meaning we could not see the label) and we had to write 3 full paragraphs describing it (after we tasted it). I had to guess the varietal, vintage, food pairing, where it was grown, etc. I handed this paper to my professor and I am anxiously awaiting my grade. If you can believe it…. I wrote Sancerre. I cannot believe I have retained enough to get that right!!! I also wrote it was a young wine and would pair well with oysters. Or a hot goat cheese salad. I wrote much more…. We shall see what he thinks 🙂 We obviously got to see what the wine was after we handed in the paper and I snagged a picture. 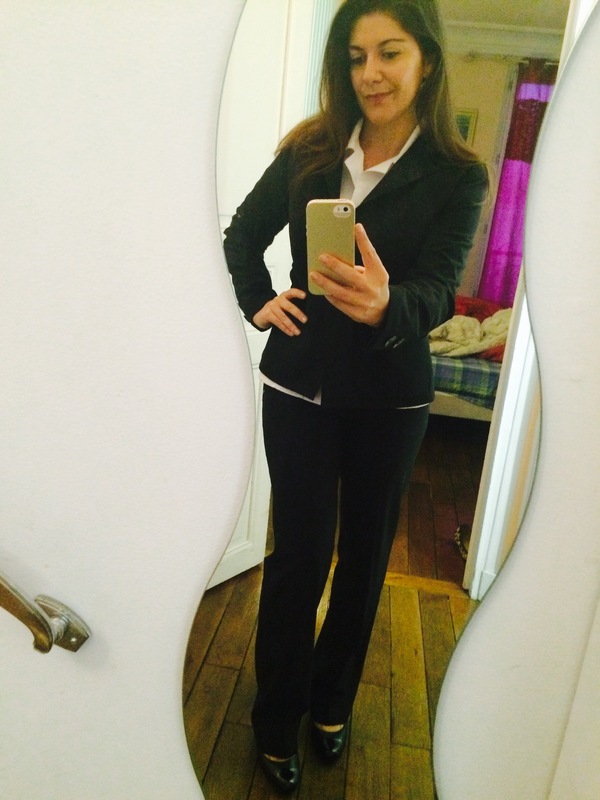 Oh, and here I am in my uniform for school! I love it…. I was actually measured and this suit was made for me. Literally, hand made. Haute Couture…..figures I am in Paris. Occasionally, I add my Hermes scarf for a pop of color. FUN FACT: Did you know that the bubbles you get out of Champagne are absolutely due to an impurity in the glass? ?….it could be a microscopic molecule of dust, a chip in the glass, a water drop, etc. When you pour Champagne into a pristine glass there will be no bubbles…. unless there is an impurity. So, many restaurants stick a knife or fork into brand new champagne glasses to create the impurity. Customers love bubbles ~ it makes it celebratory, it is fun in your mouth, etc. And what would Champagne be without bubbles?! Tomorrow is Fancy Friday and we are having a selection of cheeses plus breads made from the patisserie class to pair with our wines. We actually get to drink it too 😉 Then…we are going to the acclaimed restaurant LaTour D’Argent to spend an hour in their wine cellar. Field Trip! This restaurant has a thick, thick binder as a wine list and is one of the most expensive restaurants in Paris. Krista…can’t wait to make your omelet! And I love your uniform ! Can’t wait to hear about the farm! Aunt Jenny, Cannot wait to tell especially you about this “farm”experience. Your beautiful home has always made me feel like I am on a vineyard when I walk in. Love Love Love this post! We are making this omelet when I travel to you!!!! Cannot wait to see your pictures on the vineyard. Your pictures are so crisp! Enjoy my friend! Nicole! Thank you…My camera really does do most of the work for me 🙂 Thanks for noticing! XOXO Member the delicious omelets we had in Durango? 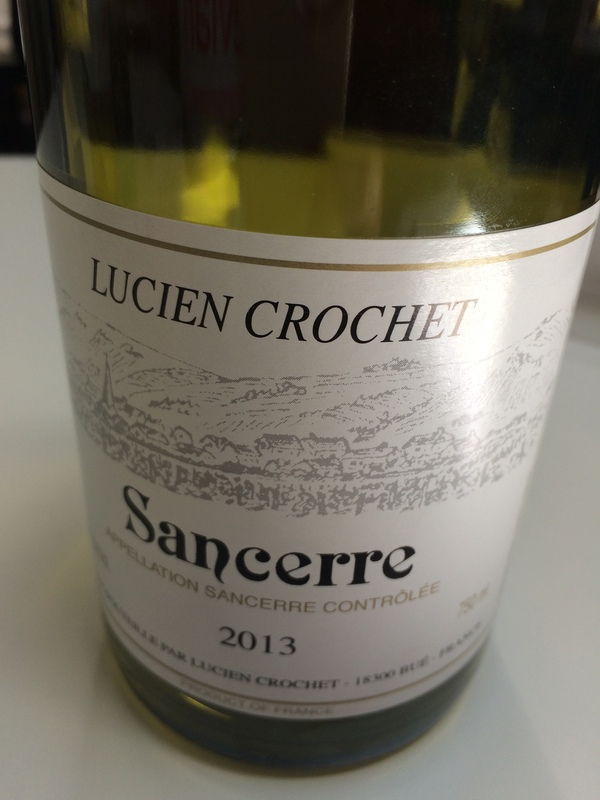 Bill brought up a Sancerre from the wine cellar for dinner tonight 9/19 in your honor! Oh my goodness Lee. Read this comment this morning…made me smile 🙂 CHEERS! Hi Bill!